Another fun blog hop for Taylored Expressions! This month the theme was Go Green. I’ve been looking through my mom’s decorating magazines and found one with the most lovely room done in a lively yellow-green, soft pink and bright pink with lots of white. I would show it but I am getting a migraine and just want to post quickly and go to bed. The flower was made from 4 die shapes; I split each in 2 for an 8 layer flower. After splitting, I punched a hole, spritzed with handmade spray using Perfect Pearls and crumpled them. Then I partially dried them with my heat gun. I gently uncrumpled them and recrumpled them where I needed more creases then I continued to dry them. I flattened them just a bit and threaded them on to a long pronged brad. All that was needed was a bit of fluffing and you get the flower you see here! I used both sets of circle Nesties using 4 of the 5 smallest, excluding the very smallest. The card is a gatefold card which made getting the ribbon on straight very easy! Once I glued on the flower, the panel underneath needed a notch cut from it so it would slip under the flower neatly so I cut a notch using an oval Nestie. I wanted foam dots under the whole panel but of course, I didn’t want the right side to stick to the card or it wouldn’t open. So I added the foam dots and punched little flowers out to place over the adhesive. This way they don’t stick to the card and it still looks nice from the other side when open. Don’t forget to visit the other blogs in the blog hop! If you enjoyed this post, I hope you will subscribe to my blog, you can become a Google Follower, sign up for RSS feeds or receive emails in your inbox, all on the sidebar. 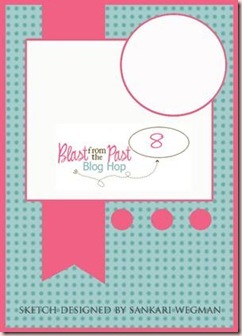 You can also click on the Blast from the Past TE blog hop tag at the bottom of this post to see my other blog hop projects. Thanks for visiting. What a pretty card! Your flower is just beautiful!Chris L.
What a sweet card! I love how retro it is. Such a pretty card…I love the flower! Love this with the party dress. Love your flower accent, too! This is so lovely! I love the flower and the paper piecing on the dress. Adorable! Love that big puffy flower! Very cool! Soooo pretty!! I love the flower too! I love this card and I love those flowers! WOW! 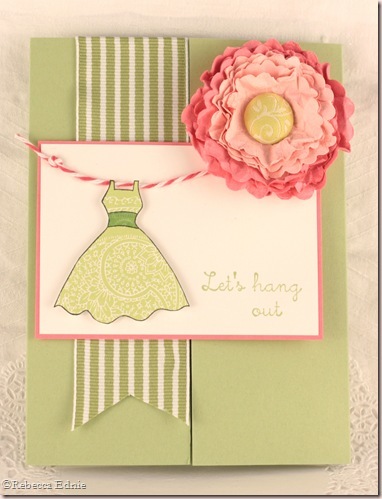 Love that pretty celery green color…so soft and elegant. Your card is super cute! Love the colors! And that flower is gorgeous! Hope your migraine is all better too. Your dress is sooo pretty, Rebecca, and I LOOOVE that fabulous flower!!!! Hope you feel better, soon!!! This is a GREAT card! Loooove that pieced dress & the colors are yummy! Hope your head feels better! I always love pink and green together, and you've done it beautifully. That flower is gorgeous!!!! Rebecca, this is sooo pretty!! Thanks for sharing your steps in making the flower. It's lovely! Hope the migraine didn't develop and you are having a pain free day! So pretty! I love the flower embellishment and what you did with the band of ribbon! OH this is gorgeous! I love the dress on the line and of course, that amazing flower! This is SO beautiful!!! LOVE the dress hanging from the twine clothesline!! !